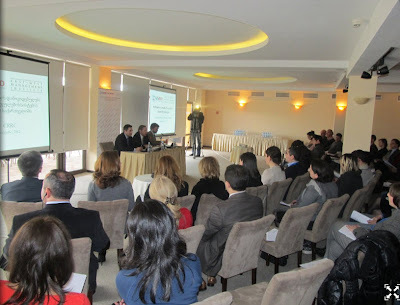 On January 24, 2012 CRRC presented a study entitled, “Attitudes towards the Judicial System in Georgia.” The study was supported by the Judicial Independence and Legal Empowerment Project (JILEP), implemented by the East West Management Institute (EWMI) and funded by USAID. Since 2003, much has been done to reform the Georgian judicial system including the establishment of a High School of Justice, restructuring of the High Council of Justice, and major changes in the makeup of the judiciary and prosecutor’s office. However, these successes have been accompanied by serious concerns, particularly regarding judicial independence. International organizations from the Council of Europe to the US State Department have urged further reform of the system. Relatively little research has been conducted to ascertain how Georgians themselves feel about their judicial system. It is with this in mind, that the East West Management Institute engaged the Caucasus Research Resource Center (CRRC), to undertake a comprehensive study of public attitudes toward the judicial system. CRRC employed a methodology that included citizen surveys, focus groups, and interviews which resulted in robust findings grounded in both quantitative and qualitative data analysis. Representatives of the Georgian judiciary, non-governmental and international organizations working in the area of rule of law attended the presentation. The link to the article is here. And find the report, which we tried to keep crisp and accessible while also rich in nuance and detail, by clicking here.